Gott in Himmel ! Die you Britisher Pigs !!! Hi there ! Colonel Marbles Proudly Presents what I hope will become an in-depth fansite on the the late '70's and early '80's classic British War comic, 'Battle'. The plan is to build up the site 'strip by strip'. The Readers Letters page, Battle Stations is also online - please email me your thoughts and comments. Apologies for not updating the site earlier - incredibly its over a year since I've added anything of any real note. There is no coincidence in the fact that my daughter is 14 months old by the way! Anyway there has been plenty going on in the small world of 'Battle' comic fandom believe it or not. First of all a new website is under construction dedicated to all things 'Johnny Red' related. My fellow 80's comic enthusiast, Moose, is putting together something that looks a whole lot classier than this site! You'll find the link at the bottom of the page. Secondly, top 'Battle' artist Mike Western was 80 recently. Happy Birthday Mike!! For the sum of £2 you can order a special tribute issue of excellent comic fanzine 'The Eagle Flies Again' from here .... Highly recommended. Also a booklet called 'The Mike Western Story' is now available for £5 + £2 postage. Cheques made out to "David Mirfin" - write to David Mirfin, 6 Rotherham Rd, Catcliffe, Rotherham, South Yorks, S60 5SW, UK. Thirdly, Titan Books have issued a hardback collection of the first volume of 'Charley's War' and the next instalment of the story is due out in November 2005 but sadly "we have no other details confirmed at the moment ... there are currently no plans for 'Johnny Red' or 'Darkie¹s Mob'". Thats a shame - but it will happen one day I'm sure. 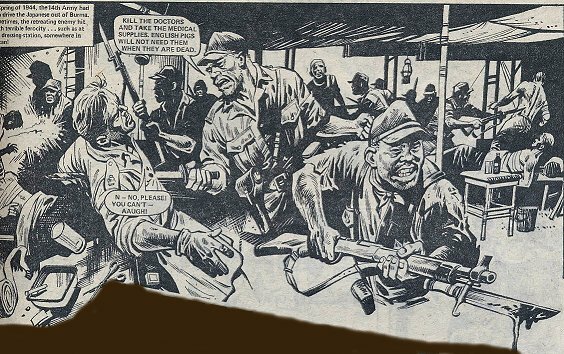 You can now buy original art from the Battle story 'Fighting Mann' at the artist Cam Kennedys website.Note that a while ago I added a scan of a full episode of 'Fighting Mann' to this site, as a sampler of this great Vietnam story. Also a great episode from the long lost classic 'The Team That Went To War' for your delictation and delight. Brilliant stuff from the Golden Era of boys war comics. N.B. were you a Warlord Agent ??!. Mean and deadly Major Eazy goes to war his own way - in a Bentley ! Kurt Slinger is a Dog Soldier on the savage Russian Front, fighting beside the mighty Panzers! Johnny 'Red' Redburn is an ace British fighter pilot flying with the Russian 'Falcon' squadron on the Eastern Front! HMS Nightshade fights the elements and the U-Boats! Your letters (ok emails!) on the site and 'Battle'. Check back often as I hope to update this site as often as I can. Cheers and check out the links below for more great old comics stuff ! A tremendous fansite for possibly the best and indeed the most important British comic strip ever ? Moose Harris is starting a great new site dedicated to our old friend Johnny Red ! A well produced site on the monthly 'Commando' war books - still going strong after 43 years! is an excellent new site which has a great overview of the history & strips in 'Battle'. Another fabulous site focusing on many UK comics with plenty of great pictures and memory jogging articles ! What a Lovely War An excellent study of how World War One has been portrayed in comics. 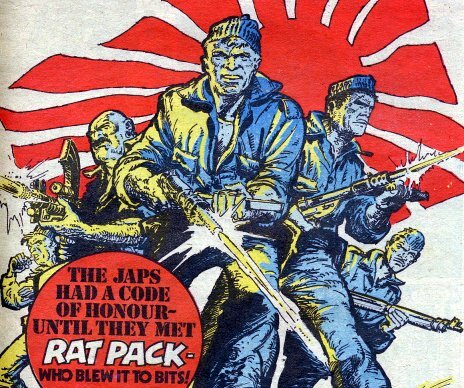 Japanese Stereotypes Strange article on the way the Japanese were depicted in British comics - Aieeeeeee Banzai !! Comics and The First World War Another great article on the treatment of war in comics ! A must-read for Charley's War fans. Drawn Slippy Nice article on '70's British comics by John McCready. Monster fun! If you want to buy back old Battle comics this is the place to do it - just don't bid against poor ol' Colonel Marbles ! The copyright of the images and writings from the comic which have been reproduced on this non-profit making site remain with the publishers Egmont Magazines Ltd .